Mary is the Hampshire County Register of Deeds driving the office towards to modernization and efficiency. Mary grew up in Cincinnati, Ohio, where she developed a love of politics from an early age. A life-long Democrat, Mary began campaign work at the age of five with her politically active family. After graduating with a B.A. in History from Xavier University, she came to Massachusetts to earn her Master’s Degree in Human Resources Management from Emmanuel College, where she graduated first in her class. In 1997, Mary made a home in Belchertown, MA, on the eastern edge of Hampshire County, where she became an active and enthusiastic resident. She worked as a human resources manager before going on to pursue her love for government and politics full-time. She served on the Belchertown Finance Committee for four years, where she was responsible for handling a $43 million annual budget. Hearing impaired since birth, Mary was appointed to the Massachusetts Democratic Party Disabilities Outreach Committee in 2011. 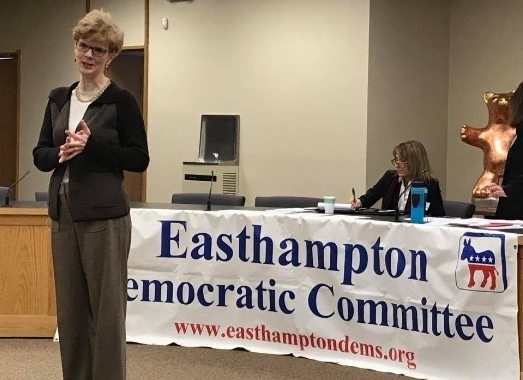 As a passionate Democrat, Mary volunteered at the Democratic National Convention in 2008 and 2016 and, for over ten years, has served as an elected delegate to the Massachusetts State Democratic Convention. She was also Vice-Chair of the Belchertown Democratic Committee for seven years and worked as a member of the core planning team for Dave Sullivan’s successful 2010 campaign for Northwestern District Attorney. After a lifetime of supporting Democratic efforts, she realized that she needed to run for office to better serve her community. In 2012, Mary was first elected Register of Deeds for the 20 cities and towns of Hampshire County. The Register’s job is to maintain a permanent public record of all documents affecting real property. As Register, she uses her skills in human resources and management to increase the Registry’s transparency and accessibility, protecting the deeds of the past and managing the needs of the future. During her first term, Mary successfully introduced electronic recording of documents, initiated legislation on electronic notarization, and updated recording standards to increase the modernization and efficiency of the Registry. She is currently preparing for the next term where she will continue to improve accessibility by providing online access to records and implement a new land record management system, among other advances. Mary was elected by her fellow Registers to be President of the Massachusetts Registers and Assistant Registers Association beginning in 2016. She has also served on the Technology and Legislative Committees. Mary and her husband, Jim Gelinas, are the proud parents of three children who currently attend Belchertown Public Schools.